Has anybody been able to figure a way to do something similar with the Nak's head unit yet? Not yet. But looking forward to it. I didn't find the 3pin connector on the Nak board (98 LS400). Instead there are two ports labels RcH and LcH. What's next?? Here you go... They look exactly like this photo. Sorry, I am unable to attach the photos I took on my phone so I am quoting another similar photo. Ok then, I will pull out the amp I built and tidy up the things a bit more. I just have to insert the pins back in the connector. Tempock, please share your after surgery experience. 1. Level of signal .. as you switch from Radio, CD to aux-in ... I assume you will be feeding pre-amp level signals (where the you do not have any volume control on the output from your external device). 2. Charger noise/hum of the external device. Turns out I have a Nak system, and there was no 3 pins for me as others have also stated. Not sure how to proceed now. The front allows for manual AUX install or using a Bluetooth to aux adapter that I have which I can stream AD2P or just simply hook up anything other than this stupid *** Iphone 7. I love the look and chose top left corner since almost looks factory! hey! I just finished this install and it was fairly simple. The only problem now is there's no sound from the passenger side. The drivers side sound is absolutely amazing. Did anyone else have this problem and solutions ? if you really want to geek out this install, you need to intercept the Tuners output egs to the pre-amp. 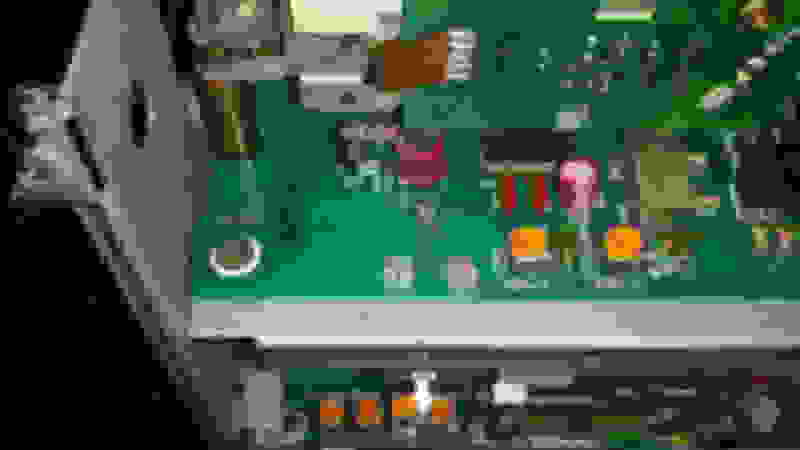 Youll have to clip and extend the traces to the stereo jack through a low level adapter so your headphone out on your ipod or whatever is level reduced and impedence matched to the preamp input so it looks just like a tuners output. you could get away with using low volume levels but that is not ideal. With this setup, all you have to do is go to FM and plug in your line in connection. That will break the loop from the tuner out to the pre-amp in and feed the ipod through the low level adapter. Im not real sure that the low level adapter in series will F up the tuner out (is it smart enough to not change a low level in?) If that is the case you can use a 2 pole switch and just flip it to run the tuner or the low level line ins to the pre-amp. Youll have full audio control and volume should be about the same between sources. I have a scrap 93 radio I just replaced so I can tinker with the traces and find the pre-amp traces. This radio I took out had a very distorted AM/FM output at times that would randomly clear up. Maybe a cold solder joint a the pre-amp chip. 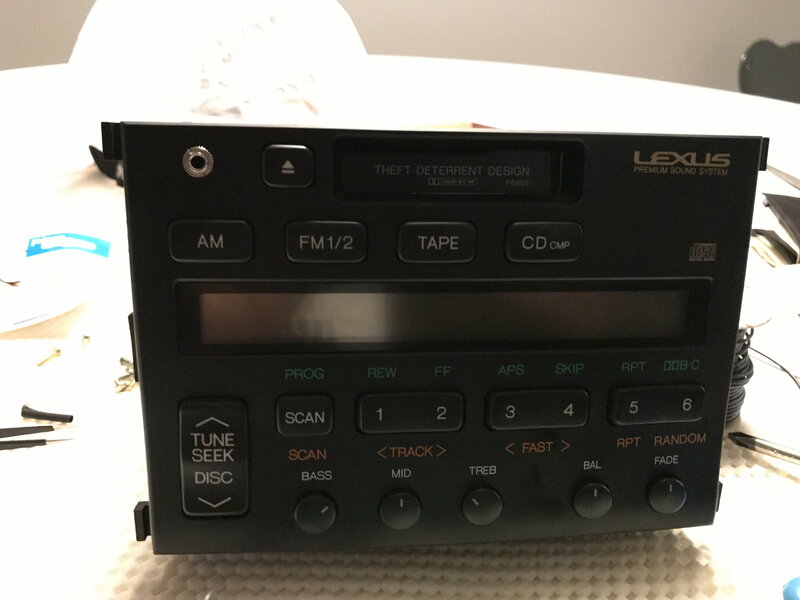 I saw those 3 pins on the 97 SC400 LExus Premium sound radio when I had the top off replacing the cassette belt (with a rubber band to get me by before the belt gets ordered) IT had turned to black goo. I finally just gave up. I bought a powered FM transmitter, stole power from the cig. lighter, and stuffed the setup next to the head unit. I drilled a hole in the back of the cup holder slot, and run the plug out through it. alright, so i have been reading through this post for the past hour, and i was wondering if the original post could be, if it wasn't already, updated with all the fixes, adjustments, and modifications that the great team of thread relpiers found out and contributed. i know that there was a lot of crap reworked in the mod design through out the relpies, and it would be nice if the original post could be completely updated with said information. thanks! i really appreciate it. i have constantly been told that if wanted to have a audio jack, i would have to loose my auto changer CD disk system... yeah ok... this is a lifesaver, especially cause there are still some people out there who actually liked that crappy last gen technology in their car lol. again, thanks alot to EVERYONE that invested their time in this so far. it is absolutely a giant help... i actually have a '92 300 that i will be replacing the old stock seats with something... ahem, better... but anyways, the point is that the new seats are not going to have seat warmers in them, and if they do, i will figure some external seat mounted switch or something. but back to the relevance to this topic, due to tthis, i went ahead and removed the seat warmer switch module from the center console, and now i have the port space that held the switches open. the port as you know divides into 2 openings on the exerior for the 2 switches. i have been thinking of threading some wires through from the center console backspace down to connect it to a possibly, (most likely, unless i just integrate the switch module case with some mods and slight 3d printing) fully custom 3D printed part. the end product will be a USB and AUX port where the two seat warmer switches used to be. later on i will post some pictures of what i have done so far as i can imagine this is a lot to try and figure out just from text. sorry for the long comment btw... i may end up creating a new post on this idea. Last edited by rentaro; 10-25-18 at 09:29 AM. as long as you didn't soderr the wires onto the board, did you ever try to unlpug the wires and see if everything went back to normal? Any updates for the SC Nak unit? Oh to update this I used a TaoTronics Aux bluetooth br04 unit, works really nice and pairs immediately when you enter the car and turn on the car, but it does not automatically play, you have to press the button, but it does allow me handsfree calling since it also has a mic and plays the calls though the speakers. Sounds like you may have used a mono aux adapter? Did you solder 3 wires on to the aux adapter? Left Right and ground?